The $15-an-hour minimum-wage law passed by SeaTac residents two years ago does apply to workers at Seattle-Tacoma International Airport, Washington’s Supreme Court ruled Thursday. One important issue left unclear: Is the pay hike retroactive? The court upheld in its entirety Proposition 1, which raised the minimum wage for hospitality and transportation workers in SeaTac. 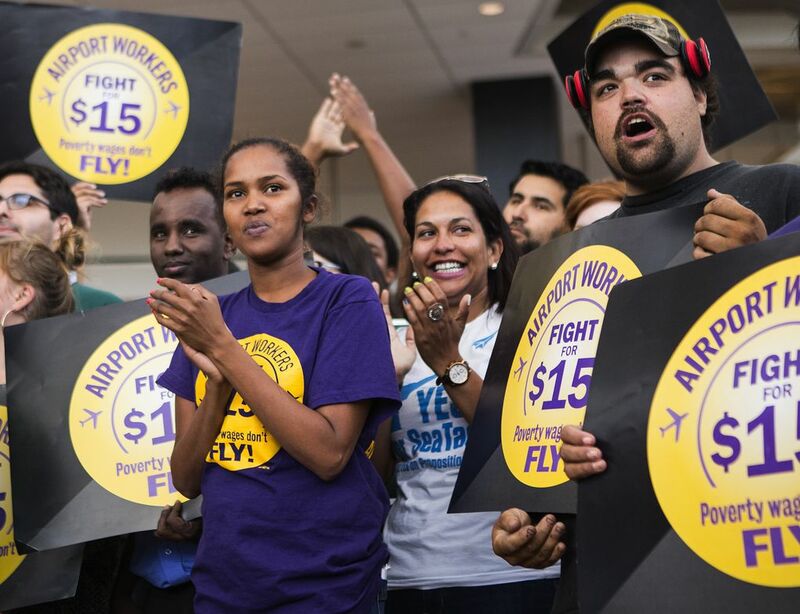 The fight for $15 at SeaTac was one of the earliest in a national movement that has since seen cities across the country boost their minimum wages. Among them was Seattle, where the minimum-wage law went into effect this April, bumping minimum pay to $11 this year and to $15 by 2021 at the latest. The ruling, overturning a lower-court decision that said the airport was not subject to the city’s minimum-wage law, is expected to affect some 4,700 people who are employed at Seattle-Tacoma International Airport by contractors, concessionaires and car-rental agencies, according to proponents of the minimum-wage law. Unclear at this point is whether employers at the airport owe retroactive pay and benefits dating back to Jan. 1, 2014, when the law went into effect. Because SeaTac’s minimum wage is adjusted yearly for inflation, the current minimum wage, as of Jan. 1 this year, is $15.24. Getting $15.24 an hour will be “a big change. It’s more money for me so I can feed my family,” said Abdirahmen Abudalli, who’s been making $11.50 an hour changing oil and fixing tires for Hertz at the airport. The 34-year-old father of two said his family has had to rely on food stamps and housing assistance to survive. “Rent is high. Groceries is high. But wages are low. How are you going to survive on $11.50?” he said. But now, with the wage bump, “we hope to not rely on public assistance,” said Abudalli, who was among some 50 airport workers, union leaders and other Proposition 1 supporters at a celebratory news conference at the airport Thursday. Backers of Proposition 1, which was approved by the city’s voters in November 2013 with a margin of just 77 votes, had always intended the measure to apply to airport workers. But opponents, including Alaska Airlines, the Washington Restaurant Association and Filo Foods, filed a lawsuit challenging the city’s power to dictate pay at Sea-Tac Airport, which is owned and operated by the Port of Seattle. That lawsuit resulted in a December 2013 ruling by King County Superior Court Judge Andrea Darvas that the law couldn’t be enforced at the airport due to a decades-old state law giving the Port exclusive jurisdiction over all airport operations. Darvas ruled, however, that the law was binding at nearby hotels and parking lots. As a result, only about 1,600 hospitality and transportation workers in SeaTac received bumps in pay to $15 on Jan. 1, 2014. SeaTac Committee for Good Jobs, the group that backed Proposition 1, and the city of SeaTac appealed that decision to the state Supreme Court, which heard oral arguments in June 2014. Thursday’s state Supreme Court decision reversed Darvas’ ruling. Indeed, in the 5-4 decision, the justices split on the extent of a city’s jurisdictional power over an airport. The majority ruled that SeaTac’s minimum-wage law could be “harmonized” with state law because the Port did not show that the proposition would specifically interfere with operations at the airport. The original state law granting power to the Port over airport operations is intended to “vest authority for the operation of the airport exclusively with the Port of Seattle, but not to prohibit a local municipality like the city of SeaTac from regulating for the general welfare in a manner unrelated to airport operations,” the court decision says. Iglitzin, the attorney for SeaTac Committee for Good Jobs, said Thursday he thinks the law is clear that, because of the Supreme Court decision, workers at the airport making less than $15 as of Jan. 1, 2014, are entitled to that back pay, plus interest. “The fact that a Superior Court judge might have mistakenly thought that the law did not apply at the airport is of no legal significance,” he said. Heather Weiner, a spokeswoman for the committee, acknowledged that it may take a lawsuit to get employers to pay the retroactive wages. Charlotte Garden, a professor at Seattle University’s School of Law who specializes in labor law, said she expects the pay bump to be retroactive. The 50-employee company must determine how much it’s going to cost to raise wages — a preliminary, conservative estimate is $275,000 a year in labor costs and employment taxes — and how to pay for those increased expenses, Cordova said. The Port of Seattle, which agreed with Proposition 1 opponents that the law should not be applied at the airport, said it is reviewing what effects the ruling may have on operations, policies and employment standards. Information from Seattle Times archives is used in this report. Janet I. Tu: 206-464-2272 or jtu@seattletimes.com. On Twitter @janettu.